Cheers! First look inside transformed Wrexham Lager brewery taken over by finance firm | News by Wales Express News, People Before Profit! 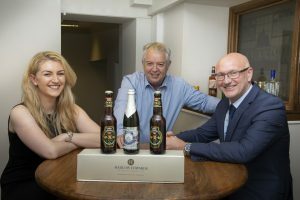 NEW finance firm offices inside the former Wrexham Lager brewery building include a bespoke bar to pay homage to its history. The first look inside the modern, state-of-the-art internal transformation of the iconic Grade II listed brewery building on the edge of Central Retail Park was revealed this week. The Victorian red-brick building, built in around 1882, is the new home for Hadlow Edwards Wealth Management which is looking to recruit more people in the coming months including two new advisors and increase their support team numbers as a result. The firm was established in 2000 by founding partners Warren Hadlow and Medwyn Edwards who have doubled the size of their team since moving to their former home in Regent Street 15 years ago. Pictured are Kirsty McKay, Steve Riley and Dominic Richmond of Hadlow Edwards by the new bar in homage to the history of the building. In 2016, they opened an office in London’s Mayfair and took over a Shropshire-based business. They now also have an advisor based in Edinburgh and with their expansion plans set to continue, they have outgrown their previous offices. Medwyn Edwards said: “It’s been fantastic to finish our transformation of the Wrexham Lager brewery which we have been working very hard on since the start of the year. “We had grown out of our old offices and moving to this new, fantastic site couldn’t be better timed as we are looking to recruit two new advisors and potentially increase the support team numbers too. Fellow founding partner Warren agreed and said: “When you take on a building of such value to a community as this, you feel your responsibility as its custodian. 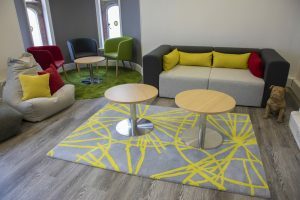 Modern touches in the building include specially designed ‘break-out zones’ for informal meetings and staff to take time out in which have grass tiles, sofas and bean bags. There is a putting green in one of the Director’s offices and stylish furniture brought in from Italy and Germany. Modern breakout zones have been created for staff and informal meetings at the Hadlow Edwards offices. In homage to its past, each of the rooms will be named after brewery terms, including The Hops, The Grist and The Mead. Specially commissioned wallpaper which incorporates old pictures of the brewery will decorate various walls throughout the building. Staff at Hadlow Edwards have also been working with Wrexham Museum to create a cabinet of artefacts from the brewery’s past which will stand pride of place in one of the building’s main waiting areas to share its history with clients and visitors. Wrexham Lager is thought to be Britain’s oldest lager brew. It was founded in 1882 by German immigrants Ivan Levinstein and Otto Isler who wanted to recreate the lager taste that they missed from home. The original business came close to failure when the deep cellars dug to keep the brew insulated and cold enough to mature were not cool enough to create the clear, crisp golden lager that they wanted. But a chance meeting on a train to Liverpool solved the problem when Ivan met Robert Graesser – an industrialist with a chemical works in Acrefair. He joined the company and introduced mechanical refrigeration for the cellars. It saved the business and after a couple of hurdles, Robert took sales to a new height, particularly as it was found that the lager travelled well which opened markets far outside Wrexham. There is evidence of it being drunk by British soldiers in 1885 at the siege of Khartoum in the Sudan. The White Star Line, the British shipping company which operated the ill-fated Titanic, was known to serve the brew on all its liners. The main brewery was demolished after production was halted at the site in 2000 – the year that Hadlow Edwards was founded. The main brewery house remained because of its listed status. The lager is still brewed at a micro brewery in the town after former MP for Clwyd South Martyn Jones bought the rights for the beverage from Carlsberg for £1. With the help of former Head of Brewing at the old brewery Ian Dale, production began again in 2011. Hadlow Edwards is a representative of St. James’s Place Wealth Management, one of the UK’s largest wealth management organisations, and they offer advice on many aspects of wealth management, to both individuals and businesses. Missing 15 year old girl found safe and well.